I heard a statistic on the radio that soda drinking is growing in popularity for fixing morning caffeine cravings. The statistic states that 27% of people drink soda over a morning cup of joe. I am a large contributor to this statistic with my 2-3 glasses of Cherry Dr. Pepper consumed before noon most days. My choice for soda over coffee most mornings is simple – it is the quickest way to get a jolt with three kids circling around me each morning with breakfast orders and day planning. Occasionally, very occasionally, I wake before the house erupts and I indulge in a hot cup of java. I like coffee. I like the taste of it. I like the smell it leaves lingering in the air for hours after it is brewed. I like how the temperature can change your insides. Coffee is good. 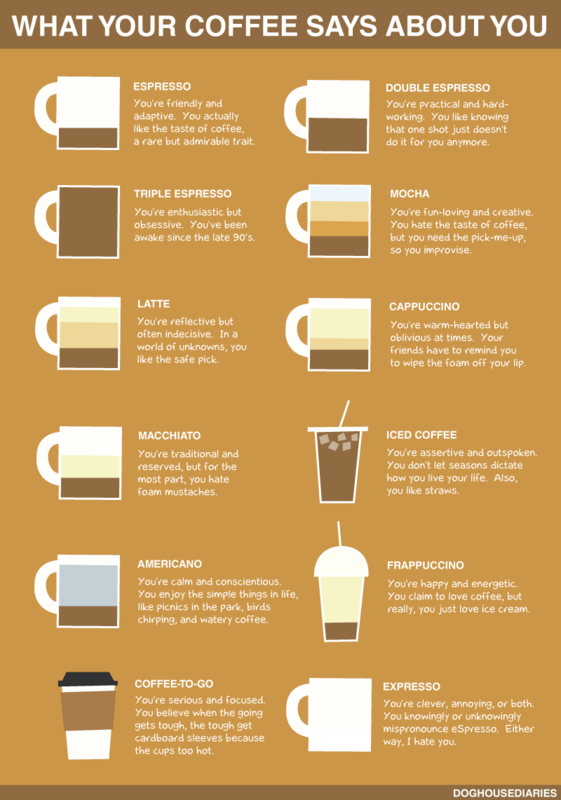 I believe the delivery system of your coffee relates a lot to the type of person that you are. This is pure speculation and fun so please do not take this to heart. Let’s get started! Standard Drip Coffee Makers – You like your caffeine. You enjoy it so much that your caffeine tolerance is high enough to demand a delivery system that can provide 10 to 12 cups of coffee each morning. This is especially true if you live alone or with one other person. It also means that you took a economical approach to coffee making. Way to be green, but you better not be wasting that coffee! Percolator – You are a little bit retro and believe that it brews a richer, full-bodied coffee compared to others machines. It most likely sits on your counter because your parents or grandparents woke you up each morning with the slight knock it would produce while percolating! You have limited options on cup production so we shall label your caffeine addiction as moderate. Moka Pot – You most likely live in Europe or Latin American countries. The Moka Pot is a small stovetop coffee maker satisfying you with one or two cups of brew each morning. Your caffeine level is well within normal parameters. French Press – A timeless approach to coffee brewing for the patient coffee maker who does not mind a little more effort in the process. This method helps keeps the number of cups under control, usually to two cups per press, but you have the control of coffee strength. You are a caffeine addict in denial masking caffeine levels by taking less frequent trips to the countertop. Pod, K-Cup or Other Single Use Coffee Makers – You are a coffee drinker out of convenience. You are easily bored and slightly lazy relying on single-serve coffee makers to provide effortless brewing in various flavor choices. Maybe you are the overworked parent, the snoozer or just too busy to be bothered with little things like brewing coffee. We will call your java intake normal to moderate. Espresso and Specialty Machines – You like the froth. I like the froth. I can not blame you but you most likely are spending the big money on these machines now to avoid long lines at coffee shops and overpriced espresso. These machines do limit your consumption levels but provide a higher concentration of caffeine with the same ease of a K-Cup machine! You are an addict and fall in the high to moderate range. However you take it – Enjoy it! Happy Mornings!